The diversity in tea is elegantly expressed visually, in the leaf, infusion of the brewed leaf and the brewed liquor, continuing through the fragrance of the tea both leaf and liquor and finally in the favour, texture and strength of each tea. The variety in tea is without equal amongst any beverage on account of the subtle variations that exist even within a single tea garden and the dramatic differences between tea from different regions and tea made in different styles. 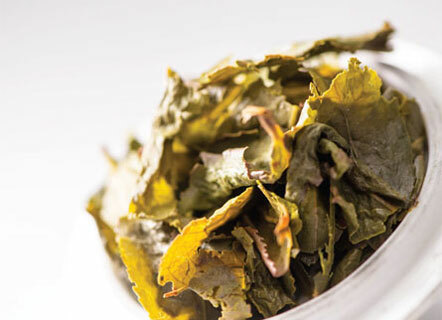 This variety is at the heart of luxury in tea and made especially unique by the fact that the variations on the eye, nose and tongue come from the leaves of one plant – Camellia Sinensis. White tea, known in Sri Lanka as Silver Tips, is amongst the most rare and refined of teas for the discerning tea drinker. 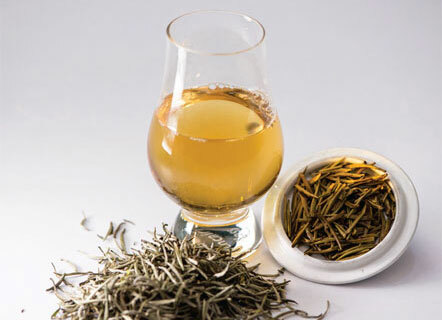 Whilst most of the tea labelled “White Tea” around the world is in fact a mix of a nominal amount of white tea and green or black teas, real white tea maintains a specific appearance with a silvery leaf, with velvety texture and producing a bright, golden liquor when brewed. Silver Tips, real white tea is made from the handpicked buds of the Camellia Sinensis plant. The picking is restricted to the most experienced tea pickers as it requires gentleness to avoid damaging the cells within the bud and causing fermentation and therefore bitterness to develop within the bud. White tea is unique in being entirely handmade, with the carefully harvested buds being hand sorted under the supervision of the teamaker, to ensure that the batch contains only the undamaged buds and then lightly baking the buds in filtered sunlight before packing them into foil lined boxes for transport. Silver Tips are typically picked early in the morning, before sunlight causes photosynthesis to begin and food to be transported from the leaves of the plant. A single tea picker can typically harvest 200-250grams of buds each day whilst he or she would usually pick 16-20kg of tea– 2 leaves and a bud– normally. Green Tea originating in China and grown also in Japan, Vietnam, Taiwan and increasingly in India and Sri Lanka, Green Tea is unfermented, maintaining a generally mild and light and sometimes astringent characteristics. The leaf is picked, withered, heated and then rolled before drying and sifting. Several different methods reflect unique traditions for green tea making in parts of China, Taiwan and Japan. The most popular tea in Japan is Sencha, made by a method unique to Japan. 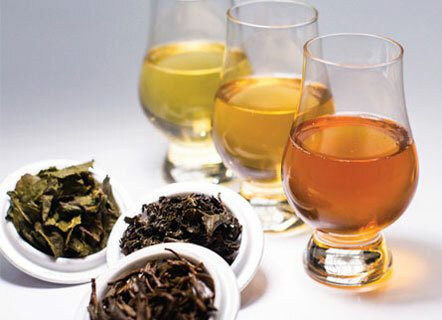 Oolong teas varying from light “Springtime Oolong Teas” which has a gentle, floral and mild sweetness to the heavier dark Oolongs which are woody, sometimes earthy with heavy fruit and occasionally caramelised notes, Oolong teas are partly oxidised or fermented. The teas are picked, often 3 leaves and a bud, withered, fermented, then heated, rolled and dried. Black teas are fully fermented, the most common type of tea from Sri Lanka, India, Kenya and other former British colonies. Black tea is picked, withered to reduce moisture and make the leaf pliable, then rolled, fermented and dried (or red) before sifting. A further type of tea which cannot be considered one of the 4 main types but is well known, in particularly in Asia, is Pu Erh. Pu Erh teas are post fermented, their oxidation happening in a di­erent way to the enzymatic oxidation that black and Oolong teas undergo. Most Pu Erh teas have an earthy, woody character, although several aged Pu Erh teas are mild in flavour. Within each of the 4 major types of tea, a thousand further variations exist, linked to the terroir of an estate and even within a single estate. 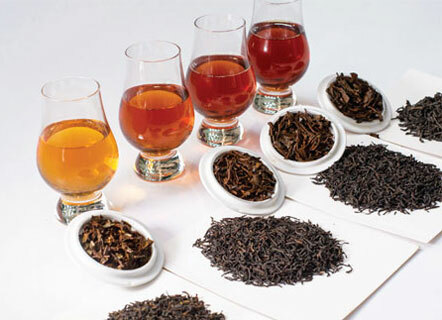 In Sri Lanka the unique topology of the island, the monsoonal weather and climatic conditions best express the beguiling diversity that is at the heart of the special relevance of tea. Q1. The 4 main categories of tea are? Q2. Which of following are not considered tea?